Perhaps this is the most important question about humans and robots. Can humans and robots coexist on this world? There are already robots in our homes and there are certainly robots in our workplaces. So, there is some relationship already. Some people are already very attached to their bots.People dress up Roombas as pets and give them names. Other folks become so attached to their robotic companions they have funerals when they cease to function. And, according to the article that inspired this post, people are very reluctant to even cause harm to a robot. There is something in human nature that makes us attach human attributes to those machines around us. Seems very weird, but I have seen this occur in my life. I have several robots in my office that I use for educational workshops and presentations. Maybe its hard to admit, but I would be very sad to see one of them break. I don’t think I would hold a funeral for my Tetrix robot, but I would miss having it with me for presentations. My little humanoid robot will be the hardest to see go to the great robot beyond. Possibly that is because it talks and seems to relate to humans around it. Yes, I know its a machine that is programmed to act that way, but still it has become one of my favorite bots. 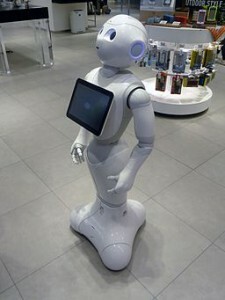 It seems likely as robots are put into homes, they will become companions to their owners. Relationships will develop. It is not as clear to me that robots in the workplace will be perceived in the same way. On the other hand, military robots have become very popular with the soldiers they work with in the field. Robots are given names and sometimes the robot have the names painted on them. The robots that seek out explosives and mines are seen by the personnel as members of their units. They are missed or even mourned if they become damaged or destroyed. This has been documented in situations in the recent Middle East wars. So, what can we make of this. Will robots become companions or even friends as they become more commonplace in homes and work? Does it make a difference if the robot is humanoid? These are difficult questions to answer and research will need to be done to see how this could effect robot use. What do you think about this? Let me know by leaving a comment. The robots have arrived but will we ever live in harmony with them or will we remain suspicious of their intentions? With all the concern over autonomous robots in the military, one would think that they are more of a future concern than reality. 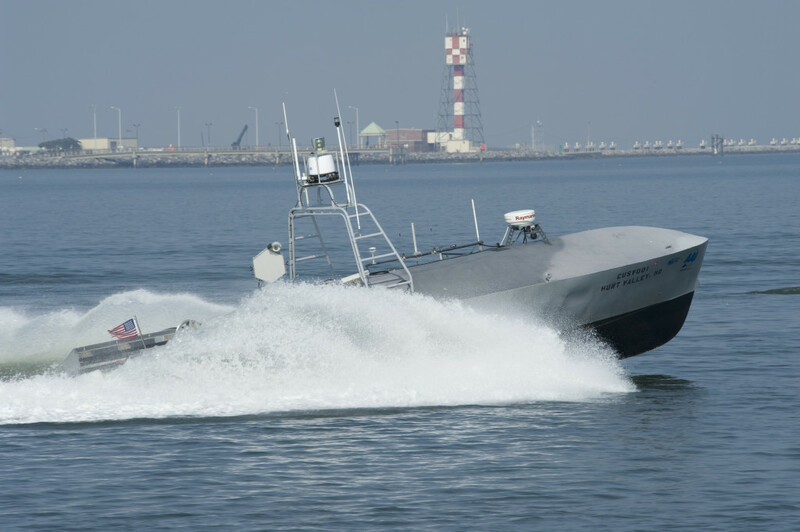 However, the U.S. Navy has operated robot ships for many years and continues to develop advanced capabilities for those autonomous ships. I saw this article on the progress of new robot ships in America’s Navy and did some research on some of these craft. Although photos exist for some of the more recent developments, the ones shown here from several years ago are still relevant for the showing the capabilities of these bot ships. In order to counter the threat of diesel-electric submarines, the U.S Navy wants to develop these autonomous sub-hunters. Diesel-electric subs are very cost effective compared to a nuclear attack boat and they can operate very quietly. So, these subs are difficult to detect and even though they have limited range, pose a significant threat. The primary motivation for developing these robot ships is cost. 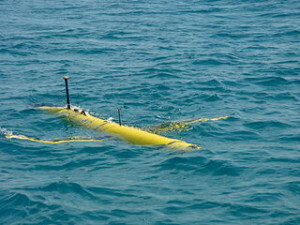 They can operate in shallow waters and survey large areas to identify threats. The robot ships will not attack, but will call in other navy assets to deal with the targets. Work on the U.S. Navy’s new anti-submarine drone is progressing and that’s bad news for diesel-electric subs. The prototype of the ACTUV is named Sea Hunter and is due to begin sea trials in the fall of this year. Then the decision will be made on deployment of these vessels. What do you think about these robot ships? The military seems to be set on developing autonomous vehicles of all kinds. 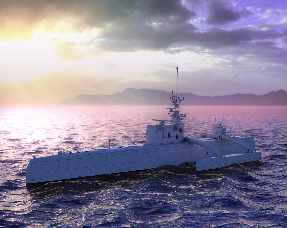 Although these ships will not be armed, but they will have to be able to correctly identify threats from other surface ships and other objects on and under the water. These robot ships will have to operate for months autonomously and probably at great distances from other support vessels if the details of these designs are correct. Perhaps the robot ships will have human monitors to oversee their operations and take the helm if needed. It is hard to believe the robotic craft would be purely autonomous at all times. Let me know with your comments. Robot researchers constantly use nature as a model for new robotic developments. Here is another example of this in these microbots. In particular, the application to robotics has to do with the idea of swarm behaviors. Insects such as ants and termites tend to act as a unit. Even though they are small, when they act together, they can accomplish amazing feats. Termites build large, complex mounds with intricate tunnels. Ants can organize large hunting parties and carry out raids against larger insects and sometimes even animals. Swarm of robots have been developed with up to 90 robots organized into a single-acting, focused unit. As of now, most of these applications have been in the military area. Gathering intelligence, locating mines and explosives, and surveillance are three common applications commonly used today in the armed forces. What will truly be a robotics revolution is when swarm robots are used in the home or personal arena. Imagine several robots in your house working together to clean the floors, do the laundry, and prepare meals. This is where the future of personal robots may be headed. Read the complete story at the links below. "Fifty years ago, predictions for the future always included robots that would, by now, be doing most of our daily domestic chores. While that hasn't happened, robots have had a huge impact on our lives, but in industry rather than the home." Robots are being used in a war-like situation, in a country we are not at war with, and controlled by civilians in a spy agency thousands of miles away. This is the new world of terrorist wars. At some point, all of this will have to be sorted out ethically. The entire question of robots as killing machines is one that cause great concern. On the one hand, these robots are probably saving innocent lives that would be lost in a terrorist attack; but, on the other hand, the robots are killing humans. Check out the story in the link below. "The kohl-eyed Hakimullah Mehsud probably is dead. He was the target for a missile fired last month from an unmanned aircraft hovering over the Afghan-Pakistani border – but launched by an operator in the US. A predator drone. For the first time ever, a civilian intelligence agency is manipulating robots from halfway around the world in a program of extrajudicial executions in a country with which Washington is not at war." Military units have used armed robots for many years in their operations, but now a civilian police force in Delhi, India is considering the purchase of one or more of these bots. No final decisions have been made on this, but the ramifications of this could radically alter future police anti-terror tactics. This could also change how police forces handle any special tactical situation. An armed subject with a hostage might find that he or she is face to face with a heavily armed “robocop” and not a negotiator. What, if any, ethical considerations must be made when civilian police have these weaponized robots at their disposal? Already, robots are used in bomb disposal situations. Some robots are used to scout hostage situations. Others provide a negotiations platform in some cases. It is not a stretch to see these armed robots as a part of Special Weapons And Tactics (SWAT) units. In fact, if you look at the Foster-Miller website, as I did in researching this post, you can see that there is already a SWAT model for sale to police departments. Wired.com published an article on this topic earlier this year about armed robots being marketed to police forces. And there are stories about TASER-armed robots being developed for law enforcement officers. I am not necessarily against this idea. These robots have the potential of saving police officers’ lives by keeping them out of dangerous situations. I think the larger question is how much autonomy will the robots have in these situations? Right now these robots are teleoperated and have limited autonomous abilities. But, if robots go into buildings and have to depend on radio links for control, there will be places where the machines will not have a communications link. In those times the robots will have to be able to work on their own. How do you make sure the robots know what to do when that happens? Read the article at the link below and decide what you think about this. The robot carries a machine gun, a camera and a bomb-diffusing chemical; demo held for Delhi cops This may change the face of counter-insurgency operations in urban landscape, forever. A relative newcomer to the world of robotics is developing a system of robots that can work together to carry-out tasks for military or emergency situations. This University of New Mexico invention will be made up of four-wheeled surface robots and aerial robotic craft that work together to scope out danger in military or emergency situations. The university’s Electrical and Computer Engineering Department invested about $500,000 to outfit the lab for these robots in 2007, said Associate Professor Rafael Fierro, a systems and control engineer who coordinates the research program. There are several different types of robots, both air and ground, that work together in this project. As a team, the robots can sense or detect radiation, chemicals, or other dangers, and then alert their human handlers or deal with the situation themselves. 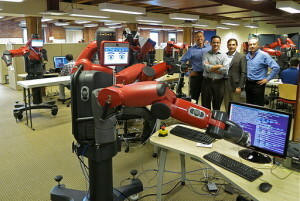 You can click on the photo below to see a larger version of one of the robotic vehicles developed in this lab. There have been many posts on this hopping robot all over the blogosphere this week. I finally decided to put the story on RobotNext in order to add my comments to the discussion. So far, most of what I have seen on this bot has been about its military applications. However, it really seems well suited to search and rescue operations. With its ability to jump over objects and onto balconies or roofs of buildings, it could be a boost to first responders to an emergency. This robot could hop onto the second story balcony of a burning building and provide up close surveillance of the situation. Perhaps, it could even carry a fire hose with it to put water on a fire that firefighters could not reach. Check out the story at the link below. During normal travel, an electric motor powers the wheels. 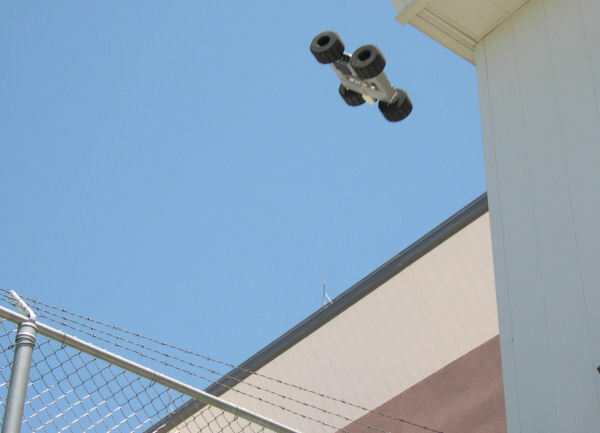 But when needed, the robot can engage a hopping mechanism and leap over 25 feet in the air to clear an obstacle (as the video posted by Sharon demonstrated earlier this week) . It may look strange, but its unique capability might give the Hopper an important role in urban warfare. Researchers at Sandia National Laboratories have been working on hopping robots which, much like grasshoppers or fleas, can leap over obstacles several times taller than themselves. This week featured a number of stories on the “Robotics Rodeo” held at Fort Hood, Texas this week. Here at RobotNext, I decided to feature some of these posts since they were not covered here during the week. At the robot rodeo, the point was to see what machines have been developed with the research funds the military has provided to companies over the years. So, about 30 exhibitors showed up to display their bots. Read the stories below to see the wide range of robots that the armed forces are looking at for future service. Also, the one story listed below that is not about the “Rodeo” is the one from iRobot on the new contract it has received to produce more robots for the military. It is the featured story from Tuesday. FORT HOOD – The first-ever "Robotics Rodeo," which aims to encourage the development of autonomous systems in support of the nation's warfighters, is drawing the world's leading robotic designers and builders to the Texas-based event this week. This week’s wrap brings five stories. Three of the stories are about robots and the military. One of these robots can literally hover outside a window and peer inside. Another can actually navigate inside your home. What does this mean for privacy? For the military, these robots can help in many situations of urban warfare, but for the private citizen it could be a big loss of rights. Then, there is the story of the robot that can rescue a person by basically swallowing them into the bowels of the machine. Finally, there is a story of a robotics store in Chicago that is aiming to have workshops to allow anyone in the area to learn about and build robots. Check out these stories from this week. DARPA has said it wants a 10-gram aircraft with a 7.5-centimetre wingspanMovie Camera that can explore caves and other hiding places, relaying GPS data and images to base. It will need to fly at 10 metres per second and withstand 2.5-metre-per-second gusts of wind. That goal is a long way off, but DARPA programme manager Todd Hylton says Aeronvironment is on the right track. "Progress to date puts us on the path to such a vehicle," he says. "Hover no bother for flapping 'nano' aircraft"
The future of heart surgery is in something called a snake robot, at least according to the people at Newport, RI-based Cardiorobotics. We decided to check it.